Packing for Morocco can be tricky. If you search for ‘Morocco’ in Google Images you’ll see photos of some people dressed incredibly conservative, and others parading in shorts. 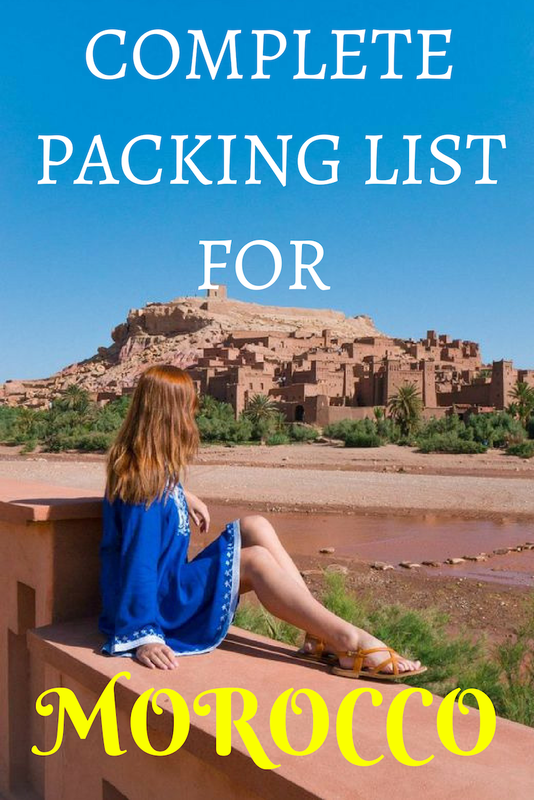 Women in popular tourist areas wear everything from bikini tops to full burkas, so naturally ‘what to pack for Morocco’ & ‘what to wear in Morocco’ are two most popular questions asked from my readers. While Morocco is considered a relatively conservative country, don’t freak out. Morocco isn’t Iran in terms of dress code. There’s no such thing as a law enforcing any dress code. Some blogs will tell you to cover yourself completely, others will tell you that anything is fine. The truth lies somewhere in between. As a tourist, you don’t have to dress like local women, but it doesn’t mean that you shouldn’t dress modestly. In places like Marrakesh, Casablanca, or Chefchaouen, you’ll see a bunch of short shorts and tank tops mixed with full-body veils. Locals in big cities don’t seem to be bothered at all, and there are tons of Moroccan women who show off their shoulders and legs. In fact, the first time I visited Marrakesh it was a spontaneous trip and I ended up having to walk around in a relatively short dress with exposed shoulders. Some would say that because of the way I dressed I must have experienced verbal sexual harassment at some point in Morocco. But I experienced none of that even as a solo traveler. Clearly, the harassment is not based on what you wear. If you’re heading to villages and less touristy towns, do cover yourself more than usual. Wear long pants or skirts that cover your knees and shirts that aren’t exposing shoulder and bust. I recommend buying one of the colorful and gorgeous pashminas/scarves upon arrival to cover your shoulders or use it as a skirt if you like. You can get some inspiration for outfits for Morocco here. Out of respect, you shouldn’t wear see-through clothing or shorts that are only ‘long enough’ for the younger crowd in modern places. I’ll also advise against wearing clothes that look too Western. You’ll stand out enough as a tourist and you don’t want to attract thieves by showing off your expensive branded clothes. Check out Some Outfit Ideas for Morocco. 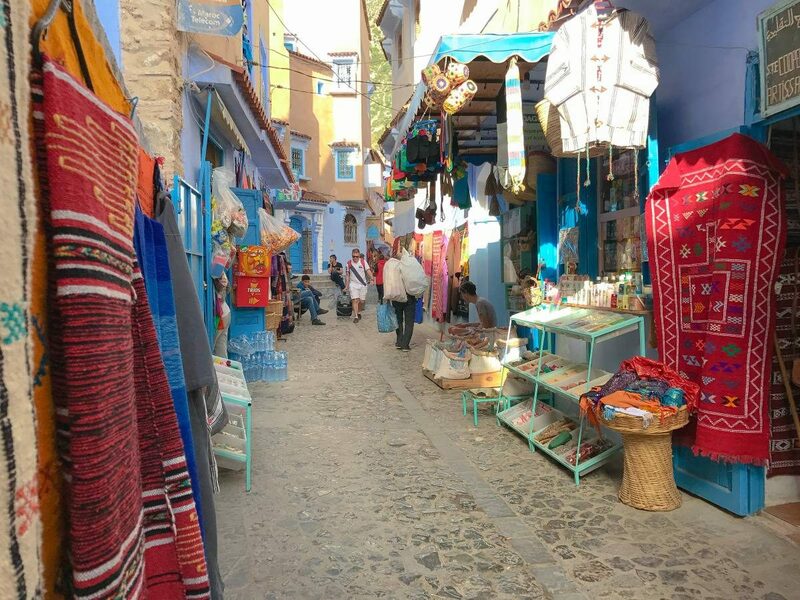 While most things can be purchased in Morocco, you don’t want to waste your time shopping for basics that you could simply put in your suitcase. That said, don’t forget your cosmetics and sunscreen. The sun in Morocco is strong, so you might get sunburnt easily. The same advice goes for sunglasses. Bring them from home, as I actually haven’t seen many people selling them on the streets. Here are some of my favorites. Temperatures in big cities in Morocco typically range from 70-90ºF during the day, with 100ºF during summer months. Nights can be cold, so bring a thick sweater or jacket, especially if you’re planning on doing a desert trip. I highly recommend Lifestraw Water Bottle that will allow you to filter any water and drink it safely. Even straight from a puddle. Don’t forget an adapter. Morocco uses a Europlug, so you’ll need one if you’re one coming from the US. Practical Shoes. Comfortable shoes are must-haves for long days of exploring, whether you’re comfortable in flip-flops, sneakers, kitten heels or anything. I highly recommend getting yourself a pair of natural leather sandals at one of the local stalls in Morocco. Don’t overpack. 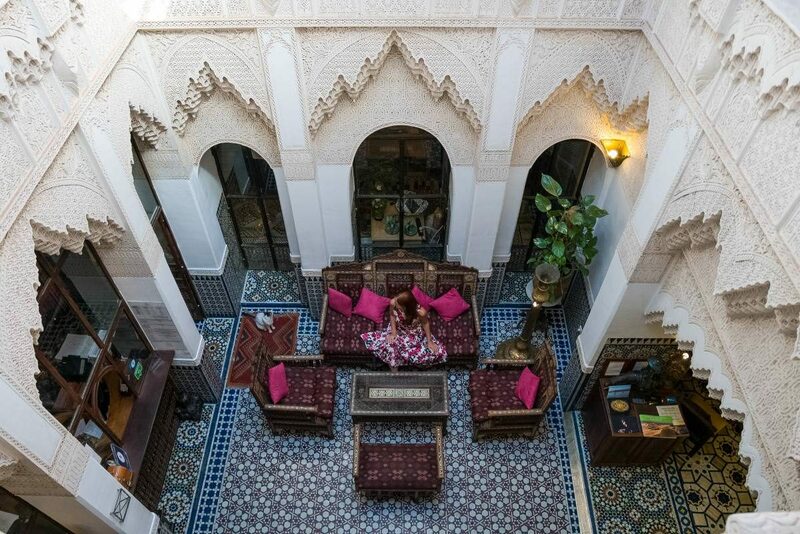 There are laundry facilities available in every riad. Simply ask your concierge or riad owner and they will be able to help you get your clothes cleaned overnight. 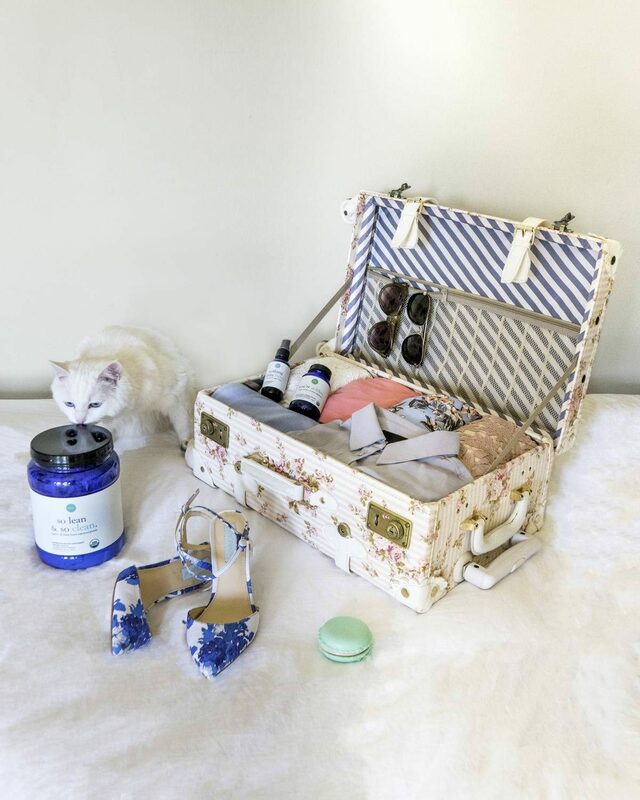 You can easily travel with a carry-on only. One thing you should invest in regardless of your destination is packing cubes. While I used a simple and cheap version of them from eBags. While I was comfortable with a suitcase, some of you might prefer a backpack. Either is fine for Morocco. Leave your drone at home. While an aerial photo capturing a gorgeous desert might sound tempting, it turns out that drones are illegal in Morocco. 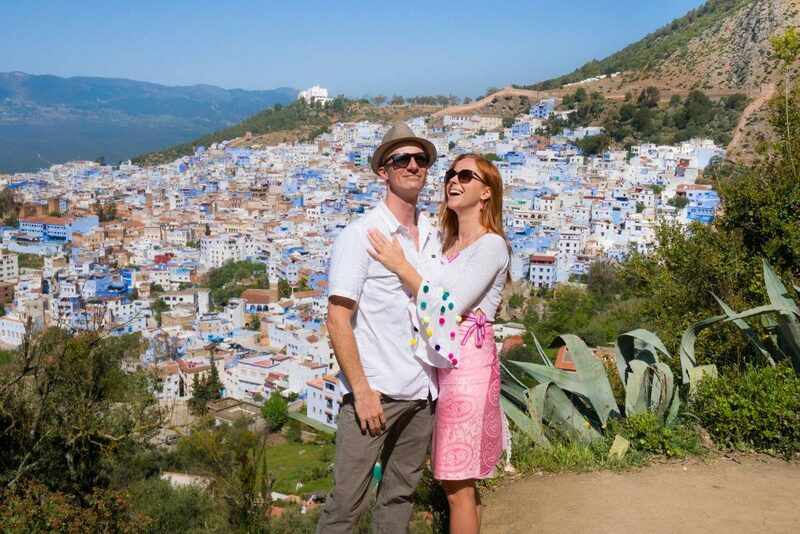 There’s no information about it online, and my husband actually brought ours to Morocco after seeing photos of numerous fellow travel bloggers. While our drone made it into Morocco and no one really cared about flying it anywhere in the country, I started getting warnings from bloggers that their drones have never made it out of the country. We stored the drone in a checked luggage when departing Morocco, but I know now that we got extremely lucky. Most drones are taken away at the airport before you depart. Don’t risk it. Other items that you should rather leave at home are makeup products that can easily melt. If you’re using a liquid eyeliner, you might want to swap it for a pen eyeliner. Don’t forget to arrange a health insurance before heading to Morocco. World Nomads Travel Insurance is easy to get and these guys are reliable. Even if you don’t end up using it, it’s better to have an insurance in case your trip goes wrong. You have been so lucky with the drone, indeed! Hi I’m going to Marrakesh 19th Feb 2019 will we get good weather? I know the evenings will be cold!! There’s no bad weather in Morocco, but evenings might be chilly. Not freezing, but sweater weather. Thanks for all the useful info, on your blog. I so want to travel to Morrocco, but I dont really get the opportunity, to travel much, besides, I am hesitant about traveling, there, alone. All the other information, which, I have read, online, sounds out of date, which, leaves me, wondering and having a lot of questions. This is really very useful. Thank you for writing in. We are leaving for Morocco April 18-May2 from the United States and would like to know if it’s ok to wear shorts over there. My wife thinks it will be disrespectful towards them . Morocco is a very touristy place, so they’re used to tourists being dressed in whatever. They will also sell you beautiful Moroccan clothes that are short dresses and will be all right with wearing it (in fact, Moroccan women loved the fact I was wearing local short dresses).